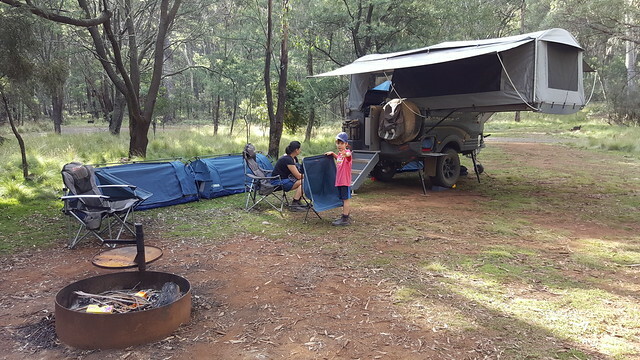 Leaving our treehouse campsite at the Pilliga, we short cut across to the Newell Highway and then turned right to head back towards Coonabarabran. 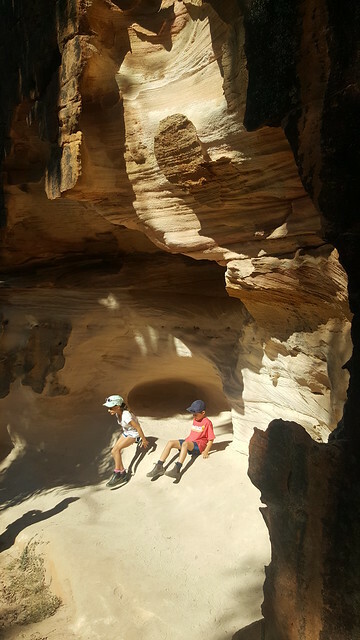 Not far down the road we stopped to do the Sandstone Caves walk, still in the Pilliga National Park. 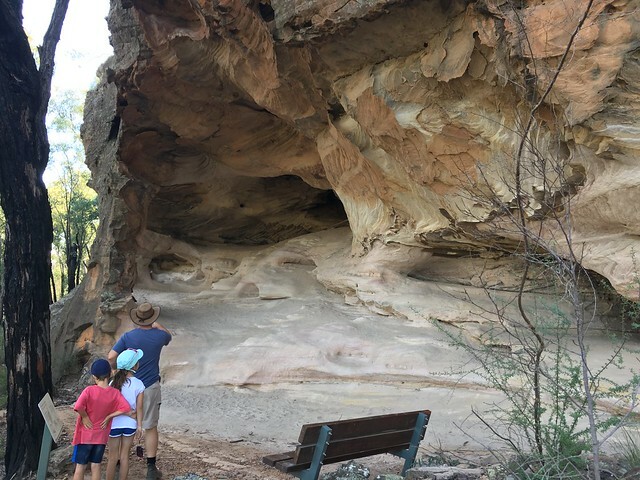 This was another brilliant walk, only just under 2km, but some great naturally formed caves that have been used by the Gamilaroi people for many thousands of years. The walk was a loop, and you could really tell how they would have used the sunny side for warmth in the winter, and the shaded side for cool in the heat of summer. Rach had a little bit of excitement as she was leading us down the track, seeing what she thought was a brown snake – none of the rest of us saw it, so we’re still not sure whether it might have been a little lizard. She was a little sheepish though for the rest of the walk! Back into the car we headed back on to the Newell Highway again, continuing south before turning back into the Pilliga to visit Pilliga Pottery. We had a look around the pottery, which was very beautiful, but also very expensive, before having a snack in their cafe. They also do a farm stay here, which could be fun if you’re into that kind of thing. (Personally, I’d rather enjoy a less organised experience of the area.) 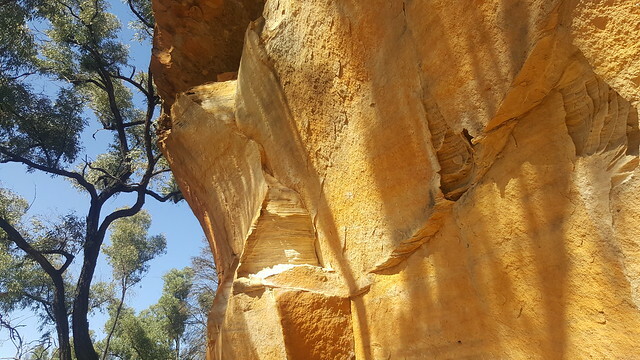 There’s certainly a great deal of history in the area, and we could quite easily come back to the Pilliga and spend far more time here. Leaving the pottery, we continued back towards Coonabarabran, again via the highway, despite a good looking dirt road heading down – the peanut gallery wanted the peace and quiet of bitumen. Go figure! We stocked up with some food and fuel in the shadows of the Warrubungles (that’s for another trip – we’ll be back!) before continuing south towards Coolah again, the plan being to head up into the Coolah tops. The drive up into the tops is absolutely stunning. Crisp blue skies all around us with fantastic views as we climb up more than 1000m above sea level. Lots of Wedge Tailed Eagles around here, you could spot them so frequently, soaring effortlessly on the updrafts around the hills. The landscape changed very quickly as we moved into the National Park itself. Tall gums surround us and cast long shadows across the road as we head towards the first campsite we had planned to check out. The Barracks is another free site with great facilities including a toilet and a large shelter and picnic tables. There was also a huge amount of fire wood left after the long weekend that wasn’t used, so we decided to set up here – at least for the night. Campsite decisions are often tough when there’s too much choice! There was some small debate before bed concerning the positioning of the kids’ swags, as the originally chosen location wasn’t going to work for some reason (which remains a mystery to me…). Once that was all taken care of and back under control, Rach and the kids decided head to bed while I was left to supervise the fire – a task I take very seriously, and which carries great responsibility. Ella felt a little unwell during the night and had an upset tummy for a while, but that wasn’t too much of a drama. 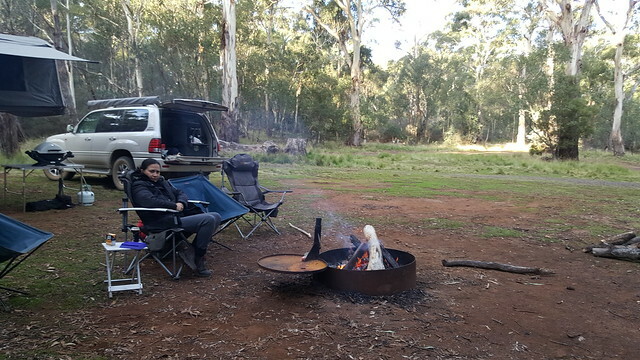 There was enough heat still in the fire in the morning to stoke it up again so that we could stay warm once out of bed, as it was a little bit cooler (Coolah?! anyone? ) than what we had been used to over the past week. Camp council convened after breakfast and decided that it was time to move on. A decision partly made due to the fact that we had chosen to not bring any bikes on this trip, and the kids were going a little stir crazy without them. (OK, they may have been starting to drive us insane…) So before long we were packing up again, ready to move on. It was a bit of a shame to leave as this is a really beautiful area that I’m keen to explore, but it will still be here in the future. 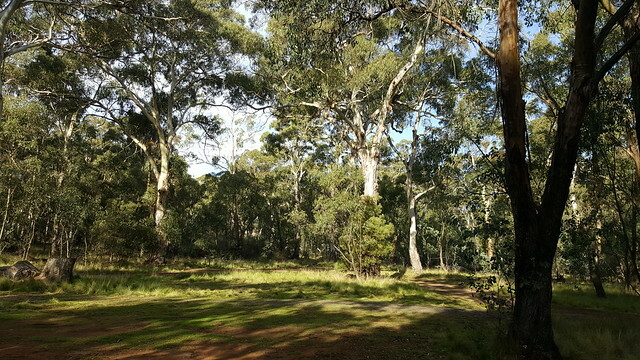 It is probably a good spot to explore with another family or two, and spend a couple of days around some nice warm camp fires and lots of cooking.